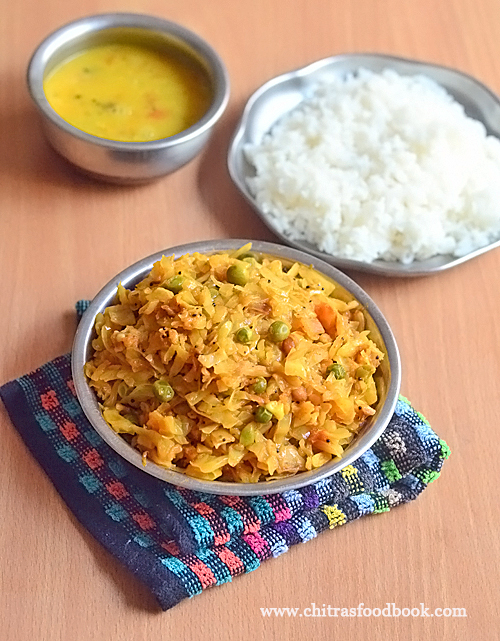 Vendakkai poriyal with tomato( Lady’s finger curry) is an easy, yummy side dish for rice. 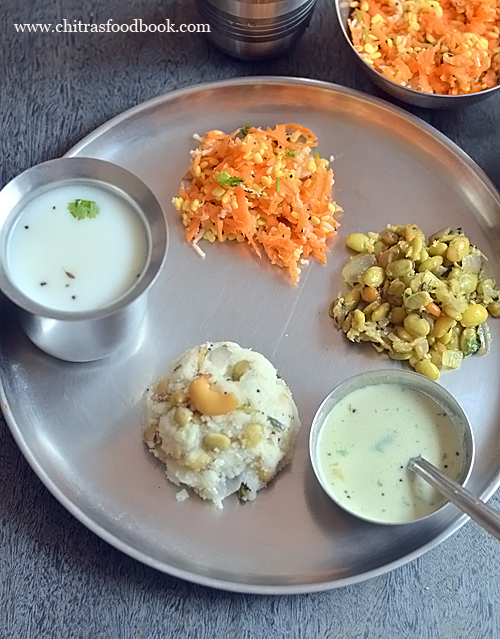 Generally South Indians make vendakkai poriyal in two ways. 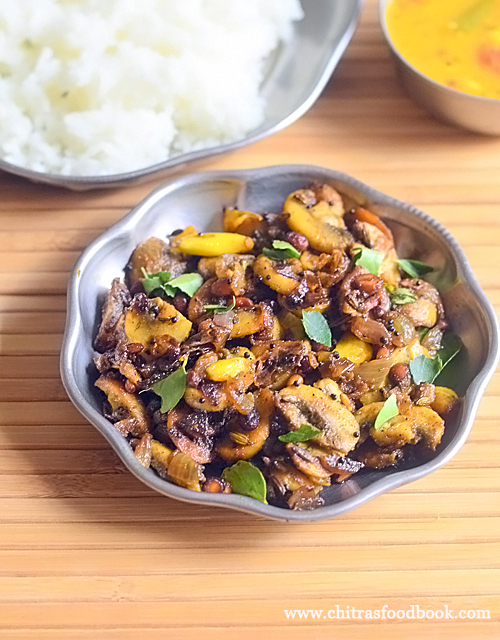 One in a simple way by sautéing onion, green chilli and thinly sliced lady’s finger cooked to become crispy & soft. 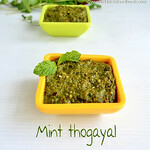 Optionally it can be garnished with coconut. Second version of vendakkai poriyal is without coconut. 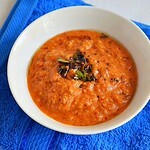 It can be prepared adding onion, tomato and masala powders. 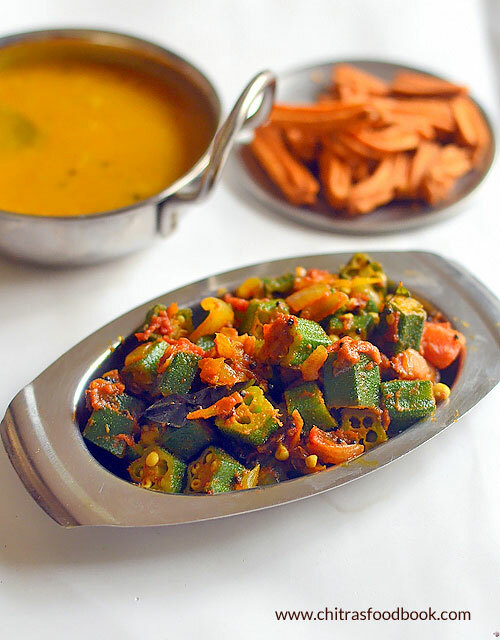 As I had already discussed Lady’s finger poriyal with coconut, I thought of sharing this vendakkai poriyal recipe with tomato. 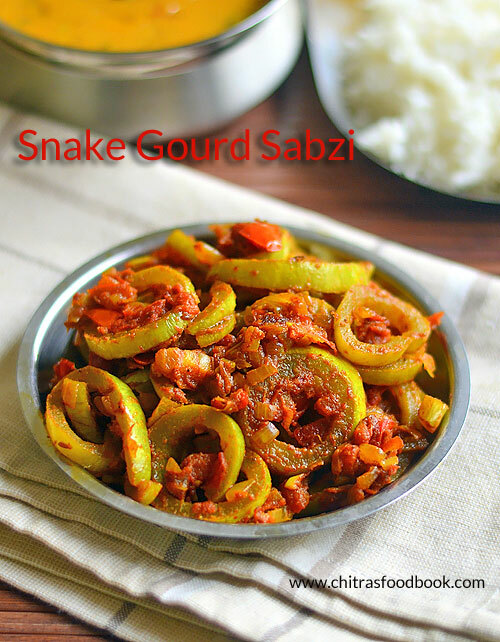 Its a dry curry recipe that can be served as side dish for rice. 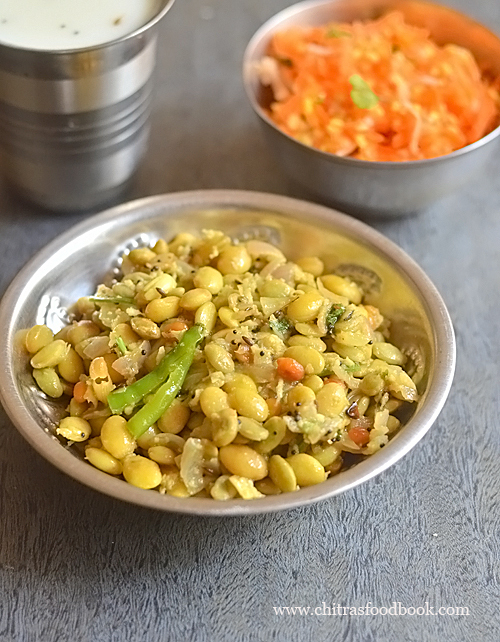 We enjoyed it as a side dish for sambar rice. 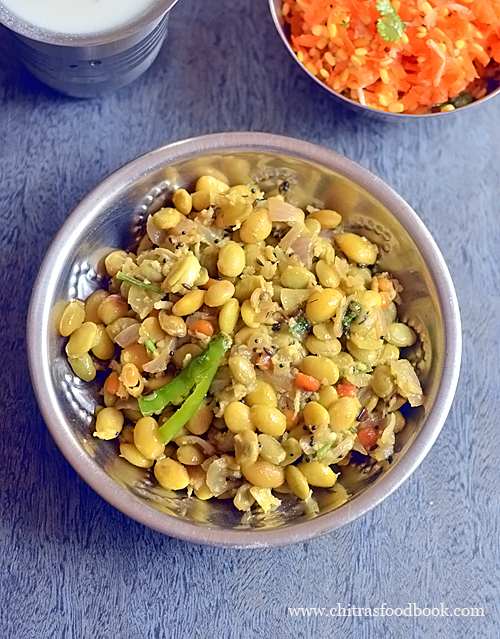 If you like to eat dry curry, you can have this poriyal as a side dish for roti as well. It tastes great with mild tangy and spicy taste. 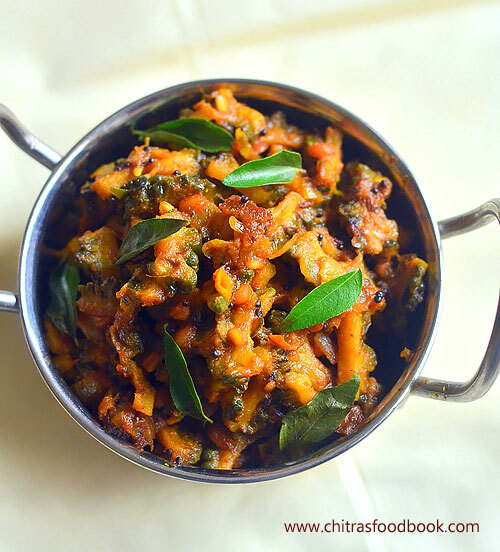 Friends, do try this version of vendakkai poriyal with tomato, onion and share your feedback with me. 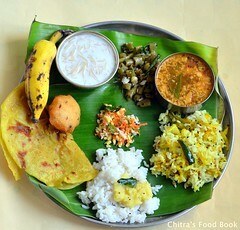 Lets see how to make Tamilnadu style vendakkai poriyal with step by step pictures. 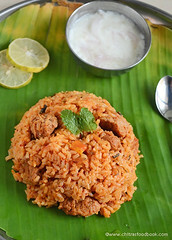 Vendakkai poriyal with tomato for rice and roti ! 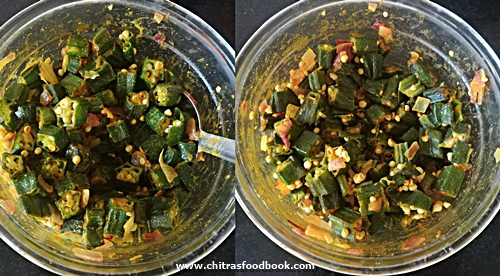 Wash and chop vendakkai / lady’s finger into small pieces. In a kadai, heat oil and temper all the ingredients given under “To temper”. Add onion and saute till transparent. Add tomato pieces and saute till mushy. 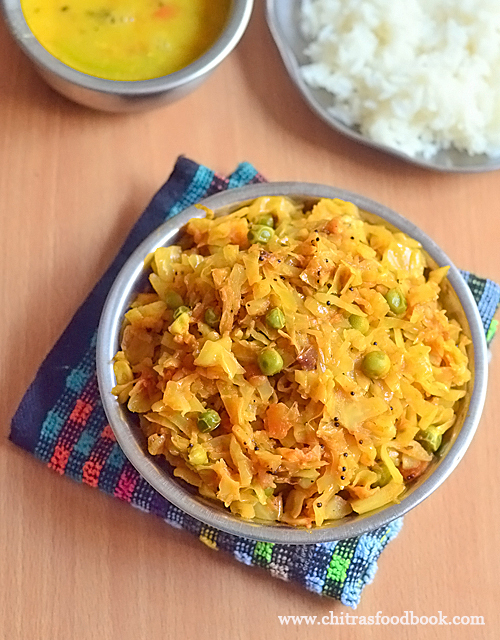 Add turmeric powder, sugar, salt, sambar powder and mix well.Add vendakkai and saute well. Sprinkle little water. Cover the kadai with a lid and cook in low flame for few minutes. Toss it whenever needed. After the lady’s finger is cooked soft, switch off the flame. Garnish with coriander leaves. 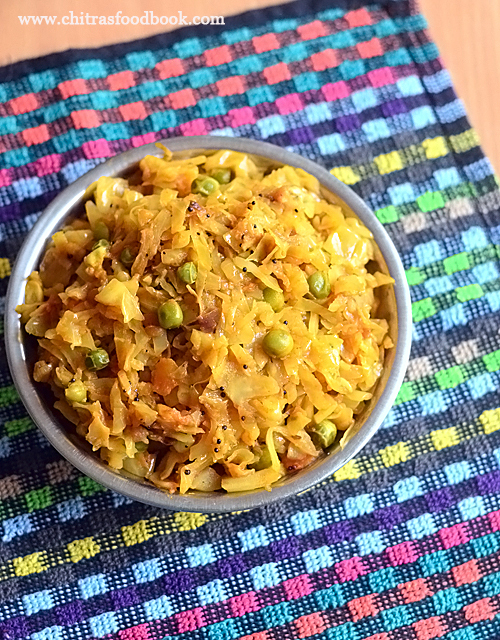 Serve with rice and roti ! 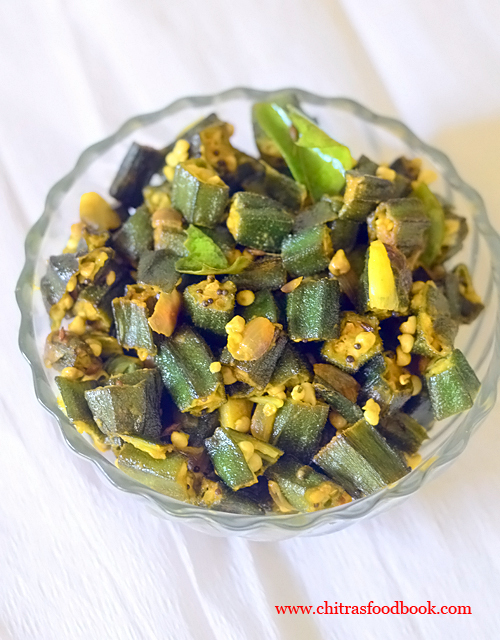 Wash and chop Lady’s finger / Vendakkai into small pieces. Finely chop onion, tomato into small cubes. Heat oil in a kadai. Temper mustard seeds, cumin seeds, big onion, curry leaves and saute till onion becomes transparent. Add tomato pieces, required salt and saute till mushy. Add sugar, turmeric powder, red chilli powder +dhania powder or sambar powder. Mix well. 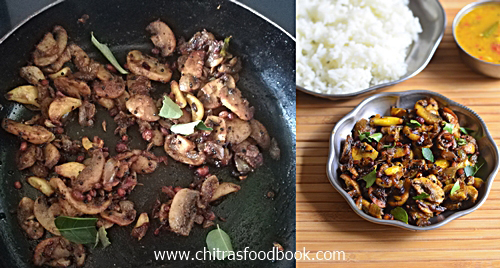 Lastly add the chopped vendakkai and saute well to coat with the masala. Mix in medium to high flame till its sliminess goes off. Sprinkle few tbsp of water. Keep the flame low and cover the kadai with a lid. Mix once or twice in the middle. Cook till the Lady’s finger becomes soft and cooked well. Switch off the flame. 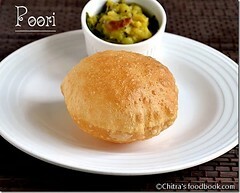 Enjoy with rice and roti ! 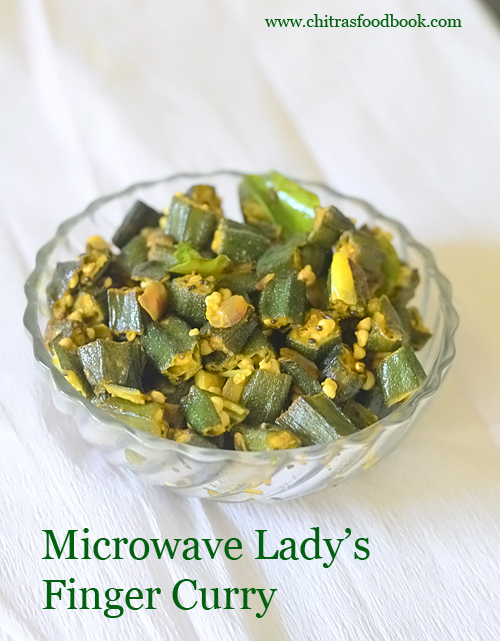 Addition of sugar and turmeric powder helps to maintain green color of Lady’s finger. You can add 1/2 tsp of garam masala powder if you like. Do not add more water. Just sprinkle few tbsp of water whenever needed to cook well. 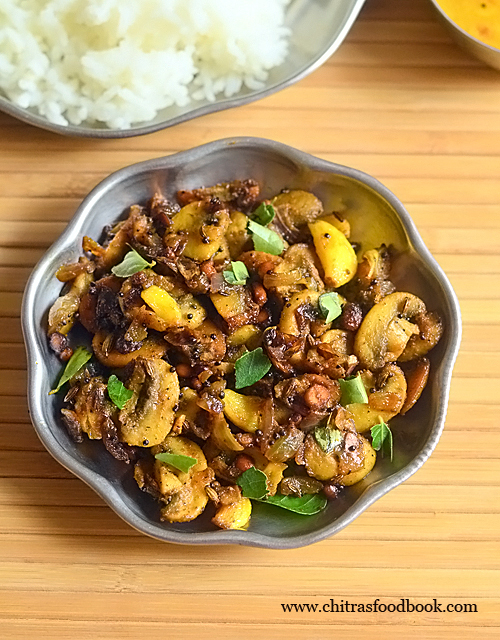 Try this easy, yummy vendakkai poriyal with onion, tomato and enjoy with rice ! 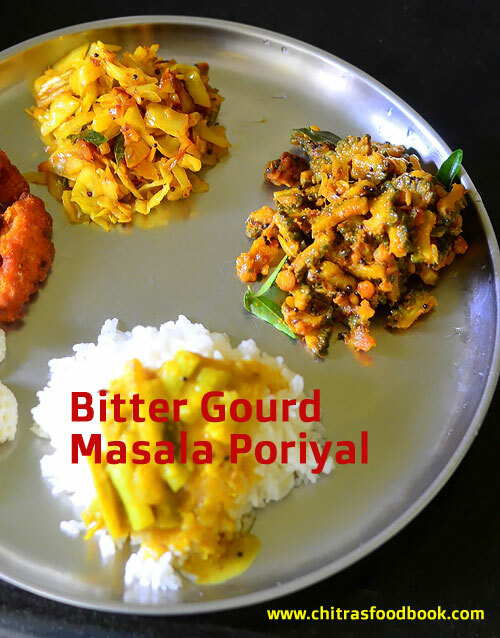 South Indian, Tamilnadu style Bitter gourd masala curry for rice / Pavakkai masala poriyal without coconut was my recent try using bitter gourd. 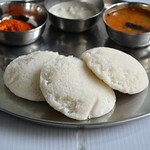 Usually I make pavakkai pitlai or pavakkai poriyal with coconut in my MIL’s style. For a change, I tried this bitter gourd masala curry adding spice powders and garam masala powders. I made it easily using my pressure cooker. It came out very well and finger licking good with its own slight bitter taste. Sendhil who is not a big fan of this veggie liked this bitter gourd curry and had it without any complaints. 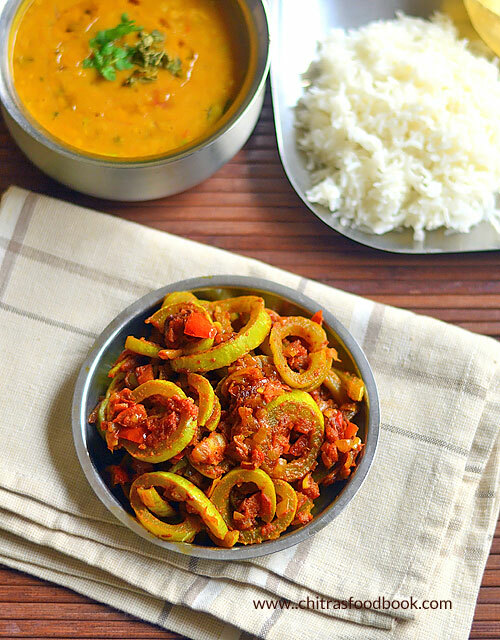 If you are a fan of bitter gourd like me, you must try this Pavakkai masala poriyal. You will love it for sure. 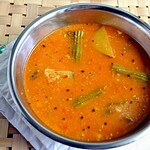 It is a good side dish for sambar and curd rice. 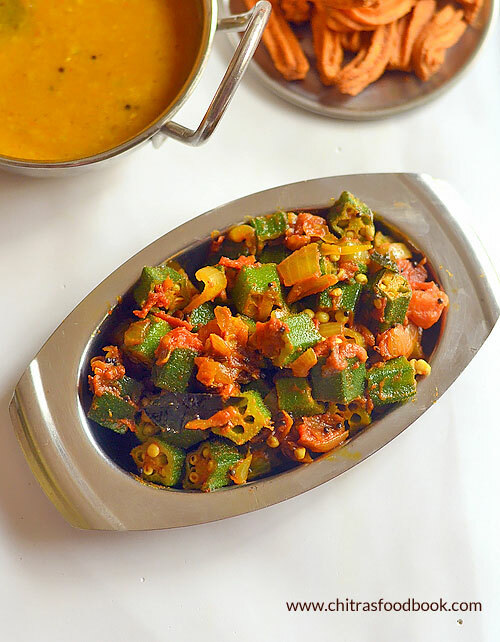 If you want to make bitter gourd curry without bitterness, you should thinly slice the bitter gourd, remove the seeds. Soak in sour curd or buttermilk, salt for 20 minutes and squeeze it before cooking like I did in my bitter gourd biryani recipe. But I won’t recommend this step for this poriyal as the nutrition of this vegetable will be lost. So what I do is, I slice the bitter gourd thinly. I add more tamarind and jaggery to reduce the bitterness. It works well. 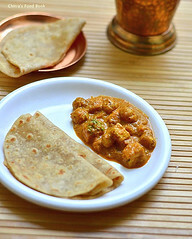 Friends, lets see how to make this Tamilnadu style Pavakkai masala poriyal with step by step pictures. 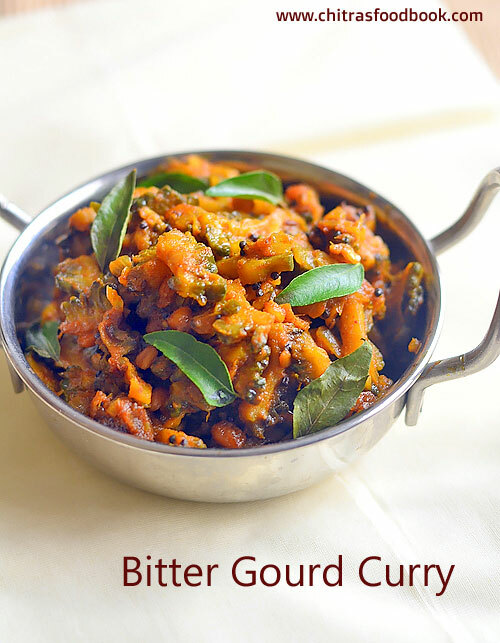 Check out my other bitter gourd recipes too ! Wash and slice bitter gourd into thin slices. Heat oil in a pressure cooker base. Temper the ingredients. Saute onion, gg paste. Add thinly sliced bitter gourd, turmeric powder and salt. Saute for a minute. Add red chilli powder, coriander powder and garam masala powder. Mix well. Lastly add tamarind extract, salt, jaggery. Pressure cook in very low flame for one whistle. Boil if there is excess water. 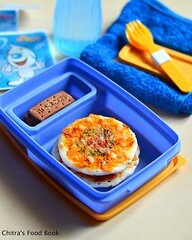 Serve with rice ! Wash and slice the bitter gourd thinly. 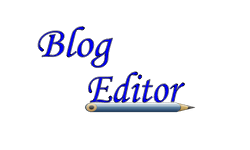 Remove the seeds and discard it. Do not slice it too thinly because it will become mushy after pressure cooking. Chop the onion and set aside. Heat oil in a pressure cooker base. Splutter mustard seeds, urad dal, chana dal, curry leaves. Add onion, ginger garlic paste and saute till raw smell goes off. Add thinly sliced bitter gourd, turmeric powder and salt. Saute till bitter gourd becomes dark green in color. It takes 2 minutes. Add red chilli powder, coriander seeds powder, garam masala powder and saute for a minute in medium flame. Lastly add 1/2 cup of tamarind extract, jaggery and mix well. Do not add more water. Pressure cook in very low flame for one whistle. Open the cooker after steam is released. Mix gently and boil if there is excess water in the cooker. Boil in high flame for few minutes to evaporate the excess water.Check for taste, add more chilli powder or jaggery if needed. If you feel tanginess is less, you can add lemon juice after switching off the flame. Garnish with coriander leaves. 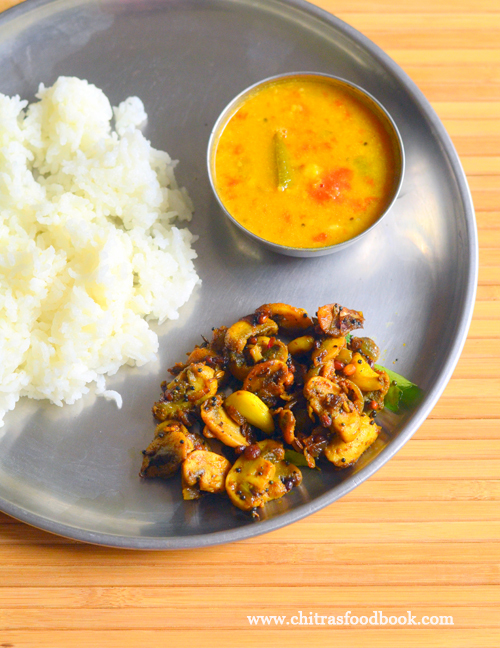 Serve and enjoy with sambar, curd rice ! Slice the bitter gourd thinly to reduce the bitterness. But do not slice it too thin. It will become mushy after pressure cooking. Tamarind and jaggery also helps to reduce the bitter taste. For variations, you can make this curry in a kadai instead of pressure cooker but it takes more time to cook. You can also pressure cook the bitter gourd separately and add to the masala. 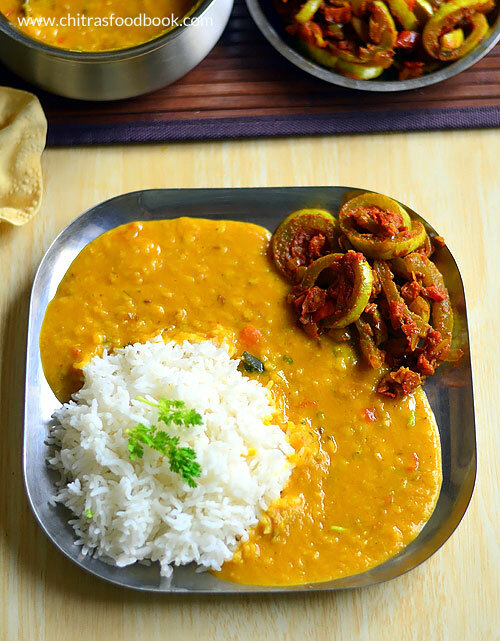 Try this healthy, yummy bitter gourd masala curry for rice and enjoy !